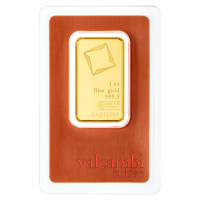 Zlatá destička Valcambi 1 oz These 1 oz gold bars are produced by one of Switzerland's best known refiners, Valcambi. Each bar is sealed in a tamper-proof package with a serial number one it that matches the serial number on the bar. The package also has an assay certificate that confirms the fineness and weight, as well as the signature of the Chief Assayer.